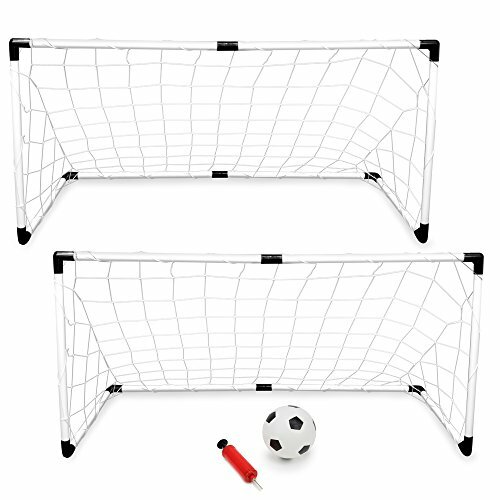 Our set of two youth soccer nets is lightweight and perfectly portable, which means a soccer field is never far away. Indoor or outdoor, good on grass, awesome on asphalt, and splendid on sand-as long as you have a ball (which we've included), you've got a field! Bring your set to the beach, pick a spot in the park, or hold a neighborhood match in your back yard. Assembly is easy and requires no tools. Also included are a 6" ball, air pump and needle. Everything you need fits right in the box, which features a convenient carrying handle. Stay active, anywhere!